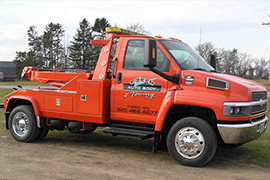 Czech Auto Body offers Towing and Roadside Assistance that is available 24 hours 7 days a week. Our service areas include Pierz, Little Falls, Royalton, Rice, Foley, Onamia, Fort Ripley, and all other surrounding cities, but we are not limited to how far we will go. If you need help and your far away call us, we’ll take care of you. We are a provider for AAA, NSD, & Quest companies. From our experience most people have towing & roadside assistance with their insurance policy and aren’t aware of it. If you’ve been in a collision towing is generally covered with full coverage insurance and will be added to your repair estimate. If your vehicle has been impounded here are some of the requirements for releasing your vehicle.